Thanks to the diligent work and full-hearted commitment of Klaudia Menzi-Steinberger as well as the invaluable technical support and expertise of Patrick Bertolf (both from Switzerland), we are delighted to share that there is now an extensive online library of Br. David’s writing, lectures, interviews, videos, audio recordings, books, and more in the German language at Bibliothek David Steindl-Rast OSB. Cover page of Br. 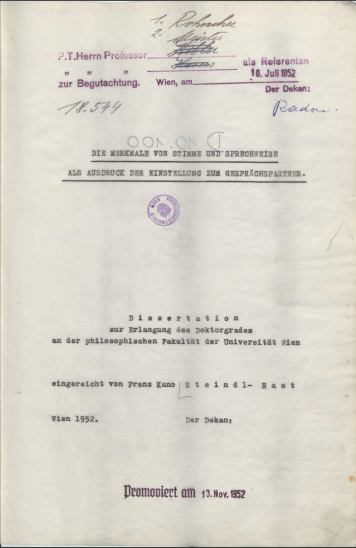 David’s dissertation 1952. Complete dissertation now available online. It is the belief of a caring community in Switzerland that Br. David’s life’s work is a valuable support to people on their spiritual path. For Klaudia Menzi-Steinberger it was a matter of the heart to make Br. David’s insights, teachings, and life experience available to all those who may be interested in his work in the German language. Thus, in 2016, she heeded her heart’s calling and began researching and collecting Br. David’s German publications. Publishing this German-language archive online expands the reach of Br. David’s English work to a broader community who can now connect and network with one other (an additional extensive collection of Br. David’s tangible archives are housed at the Special Collections and University Archives: UMass Amherst Libraries). Through this project Klaudia Menzi-Steinberger would like to “return the gift” that she has received through the discovery, study, and appreciation of Br. David’s life and work and, in so doing, contribute to the reconciliation of the world. May this library bring joy to many! To find Br. David’s work in Spanish, Portuguese, Chinese, Dutch, German, Portuguese, and Spanish please visit our International Partners. I love this site for all the inspitations it is bringing to my life. And I „love“ Brother David, I admire him.